To celebrate Thanksgiving, and for a change of scenery, I headed down to our nation's capitol. On my list of things to do was to visit Marjorie Merriweather Post's estate in north DC called Hillwood. 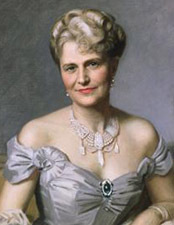 Marjorie Merriweather Post (188 -1973) was the daughter of C.W. Post who invented a coffee substitute called Posties as well as Grape Nuts. At the time of his death, when she was 27, she inherited $20 million dollars which is something like over a $100 million dollars in today's money. Suffice it to say, girlfriend didn't have to clip coupons. Although she could have spent the rest of her life counting her money, Marjorie was a shrewd businessman. She served on the board of her father's company The Postum Cereal Company, which he'd founded in 1895. With her second husband, E.F. Hutton (anyone remember those commericals, "When E.F. Hutton talks, people listen? ), she developed a wider range of products including Birdseye. The company eventually became the General Foods Corporation in 1929. In the 1950's Marjorie Merriweather Post bought Hillwood House, which she extensively renovated. It's now home to her large collection of French and Russian decorative arts. The web-site has an awesome orientation video.which you can watch here The house is gorgeous, but it is not easy to find, let me tell you. I got lost along the way, and ended up almost in Maryland! 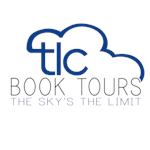 However, I did manage to find the Politics and Prose bookstore which was also on my list of places to visit. After I managed to turn myself around, I finally got to the museum but with only an hour to look around before it closed for the day. So I quickly headed over to the Adirondack House on the property to see the Wedding Belles exhibition. The exhibition features not only all 4 of Marjorie Merriweather Post's wedding dresses, to husbands Edward Bennett Close (who later remarried, Glenn Close is his granddaughter), E.F. Hutton, Joseph Davies, and Herbert A. May, but also her mother Ella Merriweather's dress, and the wedding dresses of her daughters Adelaide, and Eleanor Close and Nedenia Hutton (the actress Dina Merrill). It's amazing to see how not only fashion, but wedding fashions have changed since the 19th century. Back then, very few women wore white wedding dresses unless they were rich, most women like Ella Merriweather wore an afternoon dress, something that they could wear again. The exhibit also features the flower girl and bridesmaids dresses worn by Dina Merrill as a child. 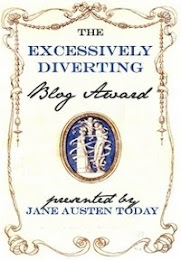 I had enough time after the Wedding Belles exhibition to visit the main house. During her third marriage, her husband Joseph Davies became the second American ambassador to the Soviet Union. During that time, Marjorie acquired many valuable works of art from the Soviets. Not just decorative arts but paintings and photographs of the Russian Tsars. I don't think I've ever seen so many portraits of Tsar Nicholas II as I did at Hillwood House, not to mention some fabulous portraits of Catherine the Great and Empress Alexandra. 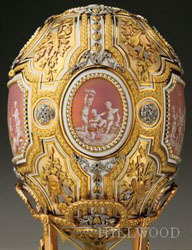 There are also several Faberge eggs, Sevres porcelain, French furniture, tapestries, and many, many Russian icons. 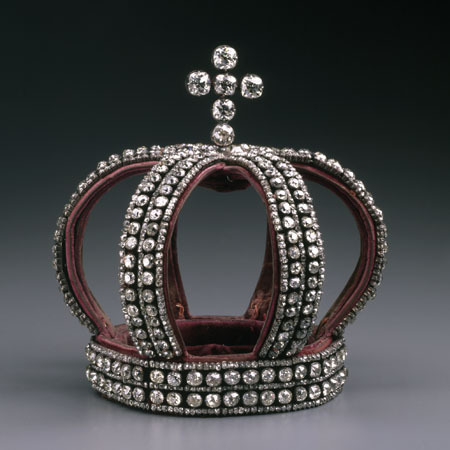 This little beauty is what Princess Alexandra of Hesse wore at her wedding ceremony to Tsar Nicholas II in 1894. 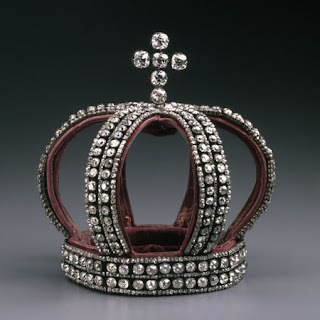 The crown consists of bands of diamonds sewn into velvet-covered supports and surmounted by a cross of six large, old mine-cut diamonds. 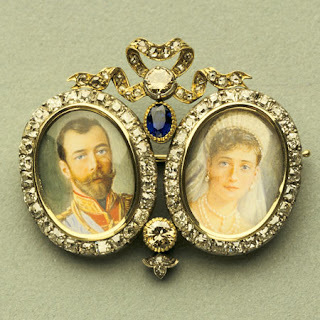 This small brooch was most likely made soon after Tsar Nicholas and Tsaritsa Alexandra’s wedding. On it, Alexandra wears a headpiece and jewels similar to the ones in the couple’s wedding portraits. Nicholas is depicted in the uniform of the Life-Guard Hussars Regiment that he wore at the wedding. 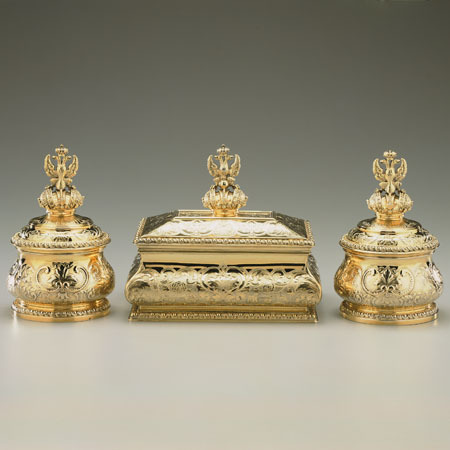 These objects are part of a large dressing table set from the dowry of Grand Duchess Ekaterina Mikhailovna, a niece of Tsar Nicholas I. 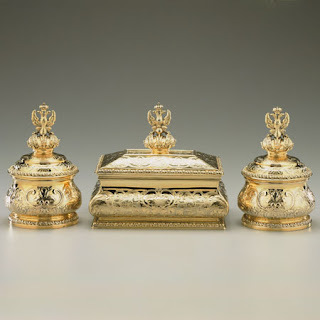 Commissioned for her wedding to the duke of Mecklenburg-Strelitz in 1851, this set reflects the tradition of grandiose objects produced in the eighteenth century deemed indispensable to the ceremonial acts of grooming and dressing. 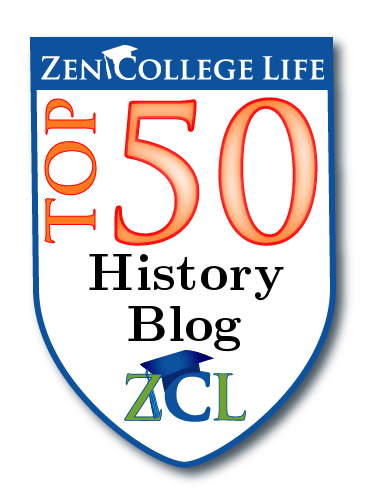 The museum houses more than 16,000 objects that Post collected over the years. I definitely want to go back in the spring when the garden is in full bloom. The estate covers 25 acres of land, including the main house, the cafe, the dacha, the Adirondack house, the Butler's house, etc. Hillwood was just one of Marjorie Merriweather Post's estates. Mar-a-lago, her estate in Palm Beach, was bought by Donald Trump and turned into an exclusive club. It originally had 115 rooms! She also owned Camp Topridge in the Adirondacks as well as a home in Brookville, NY which she sold to Long Island University for $200,000. It is now the C.W. Post Campus of LIU. What I loved about Hillwood was that it still felt like a private home. Interspersed amongst all the art work and expensive furniture are tons of family photographs and portraits. I could just imagine Marjorie Merriweather Post sweeping down the staircase in an evening gown to greet her guests at some swanky party that she was hosting. 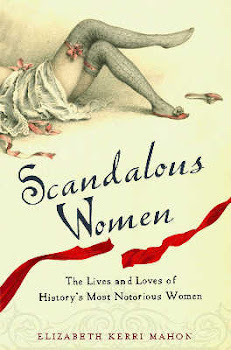 However, one of the best parts of the visit, was wandering through the gift shop and seeing my book, Scandalous Women perched between Leslie Carroll's Royal Pains and Kris Waldherr's Doomed Queens! If you are ever in Washington, DC, I encourage you to visit Hillwood House. You won't regret it! this sounds like a great place to visit. I'll have to go check it out sometime!